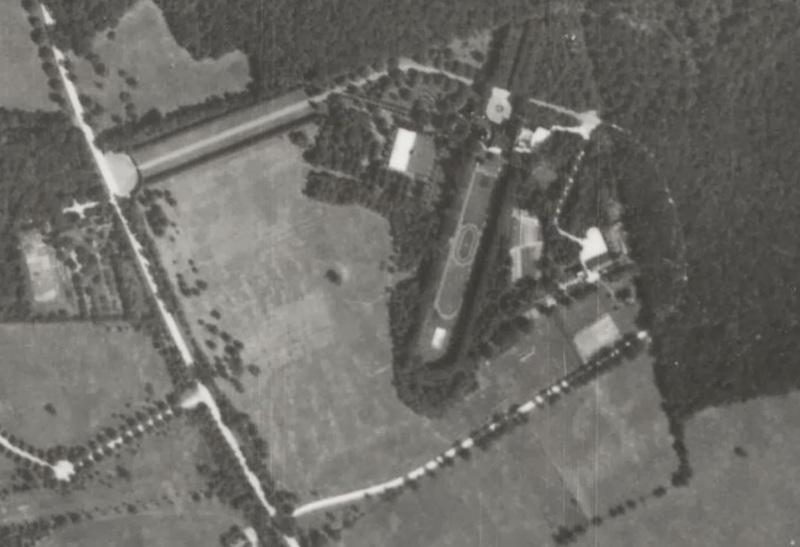 A 1938 aerial of the Virginia Graham Fair Vanderbilt estate designed by John Russell Pope c. 1911 in Brookville. Click HERE and HERE for more on the Vanderbilt estate. Photo from Stony Brook University's Digital Archive. Who owned it in '38? Landscaping looks slightly different than in the other aerial. Hmm..
My only regret is that the blurred enlargements of these 1938 aerials obscure the details ~ other than that I'm grateful to have them. Thanks, Zach ! I think all that survives is a small retaining wall pictured in the other posts, with the houses former site now being occupied by a pool. Zach, why dont we see any posts on the Vanderbilt estate Eagles Nest? There should be lots of material available. Anon 8:07, I've wondered about that over the last few years. Though of all the estates of Long Island, that would be one of my least favorite. I have rarely if ever come across period photos of Eagle's Nest that were published in architectural magazines of the era. Doesn't mean they don't exist just that in six years I haven't found em. anyone know who/which estate it belonged to?